To eat Nan bread, palm the bagel-like perfection and with a quick twist of the wrist, turn the bread over to expose its underside. Inspect for fragments of the oven wall that adhered during the baking process. With a finger nail, rapidly fleck off this debris. From the initial palming of the bread to the last bite, the entire process is gloriously tactile indulgent. This new category, What I Brought Back, will fleck away the travel debris of where, when, how, etc. in order to share with you the travel objects brought back in my suitcase [from cheesy souvenirs to exotic treasures] and what I brought back that could not be physically contained (vivid memories of eating Nan). 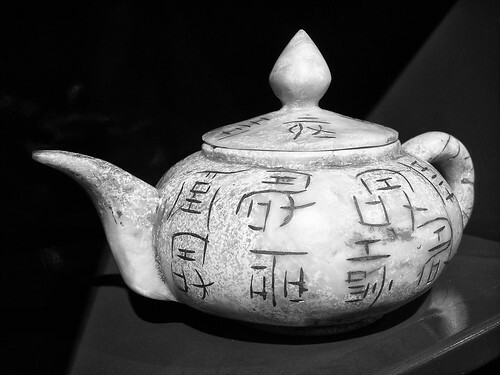 A teapot purchased from a Silk Road flea market in Kashgar, China. I brought the above teapot back from the 5 week backpacking trip with my son to China. The interior is flaking with the tea-rust built up from many a Chinese tea party; the exterior rubbed smooth by the hands serving it. My son and I were browsing and eating our way through a bazaar in Kashgar when I spotted it. My son bargained for it with not many words being said, but a lot of scribbling back and forth between me and the shop owner. Only regret, we didn’t save the piece of paper. And here’s something from the China trip that could not be physically contained — John skipping rocks on Karakul Lake. 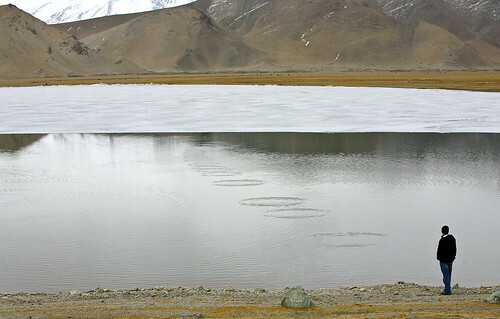 Skipping Rocks on Karakul Lake. Xinjiang Province. I like the concept very much. It is yours…officially. Clay Mama, I happen to know exactly where the tea pot was purchased. Ergo, I’m not sure I feel warm and fuzzy about the cleanliness of all those hands. Makes me want to shower with soap. I love the idea and I really, really love the lake picture! A pebble and an epiphany. Beautiful idea. Can’t wait for the installments. Oh, I love the teapot and its stories of the many generations of hands pouring tea. Your hands are touching theirs. The lake picture is so vast, and it makes me feel terribly lonely. Man is small indeed next to nature that raw. Your pictures evoke many emotions as do your writings. I look forward to this planned series! !